What does it mean to be “weird” these days? I’ve been re-watching Friends on Netflix, which has been an enjoyable way for me to turn my brain off for a couple of hours between studying for my comprehensive exams and going to sleep. Aside from Ross Geller’s insidious misogyny, the show has stood the test of time. Phoebe Buffay (Lisa Kudrow) has long been my favorite character on the show, her quirky ways and eccentricities having inspired little art freaks like myself over the last two decades. It’s true — Phoebe Buffay is the quintessential “weird girl.” Creative? Check. Musical? Check. Vegetarian? Check. Pagan propensities? Check. A well of strange life experiences to draw from in seemingly random situations? Check. Comfortably cool maternity-style dresses? Check. Crystal necklaces? Check. Chokers? Check. Not afraid to speak out about bisexuality and pubic hair? Check. Weird girls. Popular culture is full of them. While some weird girls are beacons of refreshing self-expression, others serve a pointed mystical function in male-driven narratives. I encourage you to google “Manic Pixie Dream Girl (MPDG)” and let yourself get lost in an internet vortex for a couple of hours. So what does it mean to be weird, anyway? If you stand out in public? If you dress differently than your friends? If your worldview lies somewhere outside of the hegemonic mainstream? Are you born weird, or can you develop a solid sense of weirdness over time? I’m being tongue in cheek, but I’m definitely curious about the status of the “weird girl” (or weird boy, or weird genderqueer individual … indeed, gender is a spectrum!) in a time when neon armpit hair is a viral feminist trend on Instagram. Is there a necessary shock appeal to being weird? Is “weird” synonymous with “quirky” and “cute”? One of the things I loved most about living on the west coast was how welcomed it was to be weird. The slogan of Portland, Oregon is “Keep Portland Weird,” a phenomenon made infamous by the lovable weirdos Carrie Brownstein and Fred Armisen. Flashback to four years ago in Vancouver, BC. I was twenty-two years old, walking through dark alleys with a couple of my close friends, drinking beers out of paper bags, listening to Austra playing from someone’s Iphone, and smoking Djarums (all wonderfully irresponsible behaviors that I do not officially condone!). We were on our way to a party in east Vancouver. 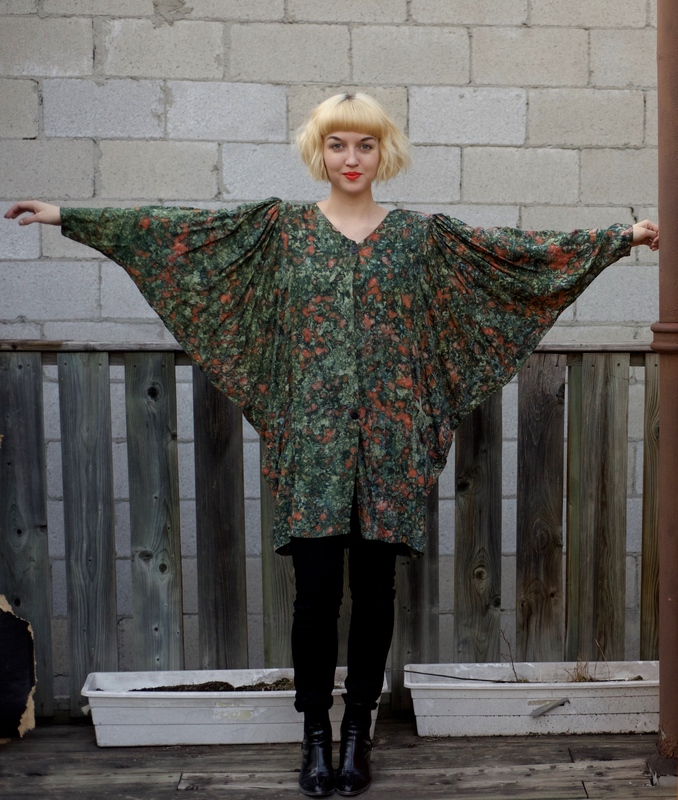 My friend turned to me and said, “You look exactly like what an eccentric auntie looks like!” I was swaddled in fabrics of various patterns, colours, and textures, adorned with delicious oddities like my ‘moon face’ earrings and forest green hair. I rocked the “eccentric auntie” look for a few solid years of living on Commercial Drive. Lately I find myself longing for those “eccentric auntie” days of lore. I still cherish my eclectic blouses thrifted from suburban Value Villages out west. 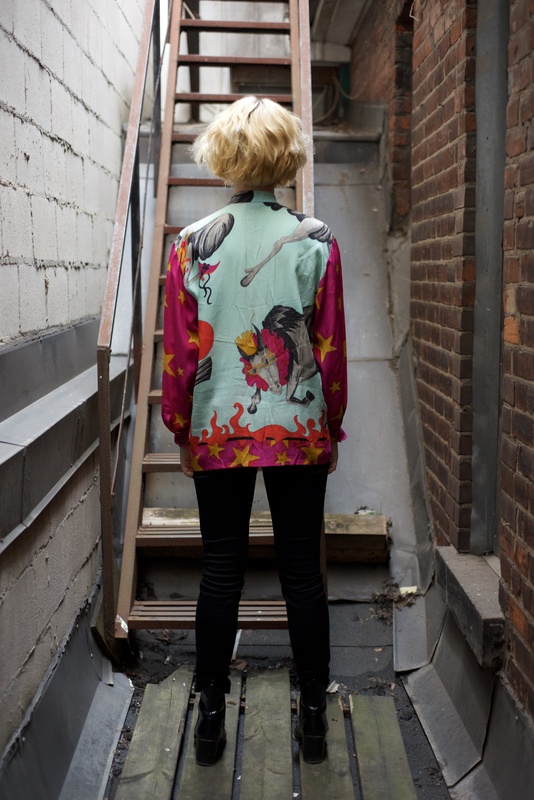 These blouses that function as landscape paintings, blouses that depict flying cows and cherubim, blouses that manage to incorporate ‘power clashing’ into their very fabric! I have fond memories of going to my first Arcade Fire show back in 2010 wearing my psychedelic bat-swing sleeved dream coat featured here. Me and my black bowl-cut and orange lips, stepping into a stadium filled with hip-looking humans, not feeling very secure in my own skin back then but nonetheless knowing that I loved what I was wearing. A statement piece, one could say. One of a kind. Clothing can definitely function as a conversation starter. This is one of my statement pieces. We often hear of the power of scent in invoking strong memories. Our mother’s sugar cookies, our grandmother’s borscht, the patchouli incense you used to burn in your very first apartment. But what about the power that an item of clothing has in taking you back to a very specific time and place in your past? In my own experience, each item of clothing incites vivid memories. My closet is an archive that I can page through at whim.